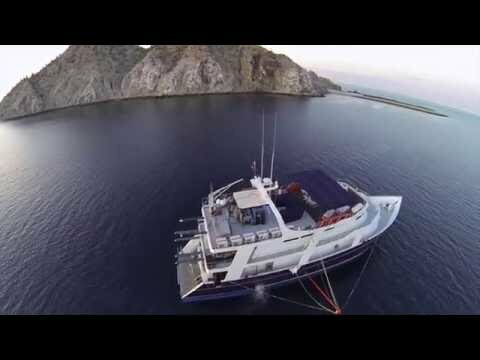 Join Blue Octopus Scuba for a week on the Rocio Del Mar Liveaboard in the Sea of Cortez, Mexico. With clear, deep waters, abundant sea life, golden sandy beaches, and inspiring vistas, the Sea of Cortez is a breath-taking destination for scuba diving. Dive on untouched walls and reefs abounding in marine life. Encounter large and small whale species, whale sharks, jumping mobula rays, and sea lion colonies. Hike and explore remote, uninhabit-ed islets. Dine under the stars in a calm anchorage, socialize with your shipmates, and make new friends. Then melt into a luxurious bunk in your own finely appointed cabin with private bathroom, hot shower, and air conditioning. Your itinerary includes 2 days of diving Angel Island, with an evening night dive or a sunset zodiac cruise with seal-ions. The next dives are at San Pedro Martir, enjoying breathtaking sites and looking for sea lions and whales! You will spend a day diving in Salsipuedes & Animas, finishing with your final night dive of the trip. The final day will be in Baja snorkeling with the whale sharks in Bahia De Los Angeles. Dive into your dreams and see what Sea of Cortez diving is all about. Don't wait, reserve your spot today!